I'm new in the photography. I'm come from Germany and my english isn't the best. I use a Canon 2000D and i would like to use Magic Lantern on my camera. 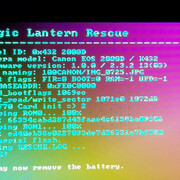 How can I use Magic Lantern on Canon Eos 2000D? Who gives me a step by step guide in easy words? I have seen this, but I didn't really understand what to download and how to use it. Maybe I can help with the development. What exactly do I have to do to try this out? Which programs do I have to download? ROM dumper: You just have to click on the link for 2000D, download the fir, copy it to a card, run firmware upgrade with this FIR, check MD5 checksums for your ROM files against the values computed during "firmware update" and stored in *.MD5 files. If your cam computes any files, of course. Share results in linked thread. Do *not* post BIN files because of copyright infringement. 2000D hasn't been tested within QEMU (software emulator) yet, so I suggest to wait for a1ex (or another dev) to contact you to make 2000D emulation run on QEMU. If you have another cam supported in QEMU you may want to start there. I've started the fir-file on my camera with a memory card of 8gb. I did the same test with another memory card (64gb). it didn't work with that one. What i've to do now? Maybe a1ex feels an itch to make 2000D emulation happen. Next step is ... well ... not that easy to determine. Today there is no maintainer in sight willing and able to start porting ML to 2000D. Ever considered spending hundreds of hours building up some codings skills? I'm currently (well, when I'm not at work) cleaning up a bunch of QEMU changes, one of them being emulation support for 4000D. I'd expect the 2000D to be very similar (if not nearly identical), so... just PM me a copy of the ROM dump. Other than that, I have no plans to port ML to this camera, because... it's likely very easy (i.e. doable by other members of the ML community, even without prior experience with Canon internals). It's going to be fully debuggable in QEMU (you can already navigate Canon menus on 4000D and 1300D, and I have no reason to believe it's going to be different on 2000D). I prefer to focus on researching DIGIC 6/7/8 models, which are a lot more difficult, but even there I need help from somebody who has the camera (and the help should not be just testing, but also coding and debugging). Why? I'm just one random guy doing this in my spare time. There are already 16 camera models already running ML relatively well (not counting 450D, 5D, 1300D and EOSM2), that require maintenance, at least making sure the codebase doesn't break when introducing new features, and so on. Adding nearly 25 new models to the mix is simply not going to scale. To address this, I'm focusing primarily on emulation - both to make it easy for others to get started with development, and also to reduce the need for manual testing (which is extremely time consuming; relying on user feedback is no longer an option). With emulation, my goal is to be able to check - by pressing a button - whether some code change is going to work on all of the supported camera models, or not. I'm not able to ask 16 people whether the current feature set (with hundreds of menu options) is still working after every code change (let alone 40, after porting ML to the remaining EOS models). I'm able to do so, to a limited extent, in QEMU, although I'm just scratching the surface currently. Still, every single camera model has specific quirks that are best figured out by somebody who has the camera in their hands. I'm here to help, but unfortunately I'm unable to do much hand-holding (especially on topics previously covered).